NOCK, Ireland —The president of the 2018 World Meeting of Families stressed that “there is no such thing as the ideal family” but that “there is an ideal of family,” which is what the church is seeking to promote through the international gathering of families in Ireland. Speaking to media at the launch of the yearlong lead-in program of catechesis on “Amoris Laetitia,” Pope Francis’ postsynodal apostolic exhortation on the family, Archbishop Martin said the program was about long-term renewal, and that the international gathering, which up to 5,000 families from overseas are expected to attend, would not be “a seven-day wonder.” The meeting is scheduled Aug. 21-26, 2018. He said the church must witness within society to what fidelity means and “show young people that long-term fidelity leads to a deep fulfillment, and that there is real value in that.” He also mentioned a theme of families and technology. 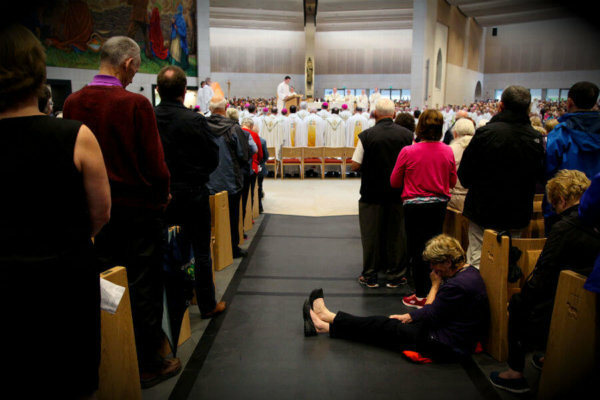 Asked by Catholic News Service why he felt it was necessary to state that Pope Francis was not betraying God’s law, the Dublin archbishop said, “Because some people say he has.” He would not elaborate. During the ceremony in Knock basilica, Archbishop Martin unveiled and blessed a specially commissioned icon of the Holy Family by Romanian icon writer Mihai Cucu, with the assistance of the Redemptoristine Sisters in Dublin. The icon will be taken around the Irish church’s 26 dioceses to raise awareness of “Amoris Laetitia” and World Meeting of Families. But he stressed that the visit would be very different from when St. John Paul II came to Ireland as pope in 1979. Anne Griffin, general manager of World Meeting of Families 2018, said the event was aiming for a minimum daily participation of at least 15,000 people. Though registrations had opened just a few weeks ago, there were already double the number of registrations for the International Eucharistic Congress in 2012 at the same stage. “We have a lot of interest from large groups that are coming from North America and from Europe,” she said. Organizers also announced there will be no entry fee for people under the age of 18.